Soft and sweet Beverley was handed into the care of Dogsfriends in Somerset along with Braveheart with no information provided and both were given new names. 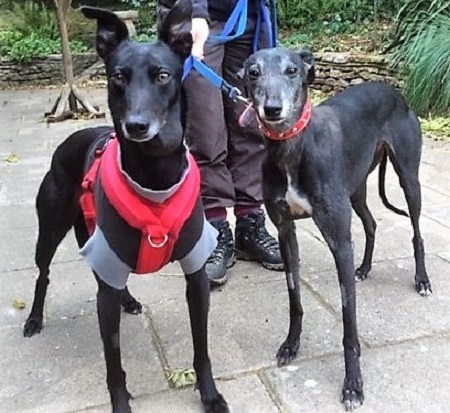 They could possibly be mother and son, so it would be wonderful to rehome Beverley together with non-oldie, Braveheart aged around 3 years, though they can be rehomed separately. 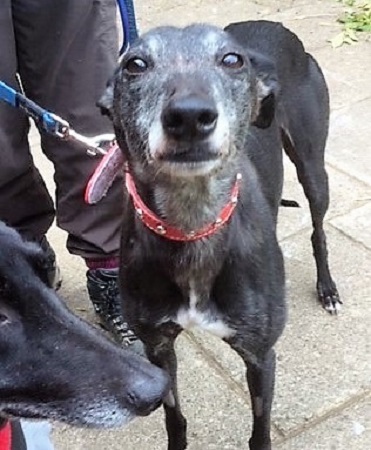 Beverley is around 10 years old and is a truly lovely lady. 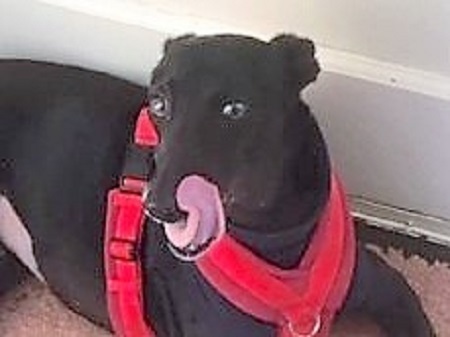 She looks like a Whippet but is too large (almost 19kg), so perhaps she could be a cross with a Greyhound. She is so well-mannered and gently affectionate that you don’t notice that you’re becoming incredibly fond of her. Beverley’s grey muzzle makes her look older, but the rest of her coat is a gleaming black and 10 seems to be the new 7, because she remains playful and the sight of a lead is the most exciting thing in the world. She walks well on or off the lead and her recall is good – though you wouldn’t want to let her off in a field of sheep. Braveheart was named by the Vet as he had a terrible wound on his neck which had been left untreated. He went into foster care with Beverley and they have been completely trouble-free. He has been simply exceptional – to begin with, he had to have his dressing changed twice a day and there was not a single complaint. He is very affectionate and gentle and, of course, he is lithe and athletic. 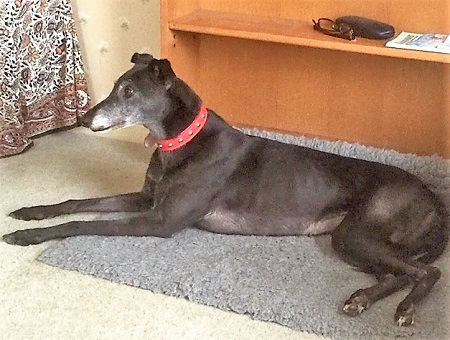 Beverley and Braveheart are friendly with other dogs and have been sharing with a variety of them. They have no experience of cats. They travel well in the car and can be left in the house, although they would prefer they weren’t. It’s difficult to fault either one of them. Please mention you saw Beverley (and Braveheart) on the Oldies Club website.